In the Fall 2012, Environmental Entrepreneurs (E2) commissioned High Road Strategies (HRS) to assess the environmental and economic impacts of the U.S. Department of Defense’s (DoD) program to invest in and pursue aggressive goals for incorporating advanced biofuels into the Air Force and Navy fuel mix. An affiliate of the Natural Resources Defense Council (NRDC), E2 is a non-partisan national community of business people promoting environmentally smart policy. 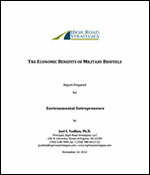 The results of this study were summarized in the report, The Economic Benefits of Military Biofuels, released November 10, 2012. After E2’s press call on November 14, 2012, the report’s release was covered by nearly one hundred electronic and print media sources, including military (e.g., Seapower Magazine), industrial (Biofuels Journal), energy (Energy Daily), environmental (Climate Solutions), agricultural (AgWeb), local (Sacramento Bee) and national (Reuters, Bloomberg Government) press sources. It also received coverage in an article in the March/April 2013 issue of Mother Jones and a February 27, 2013 article inThe Atlantic magazine. 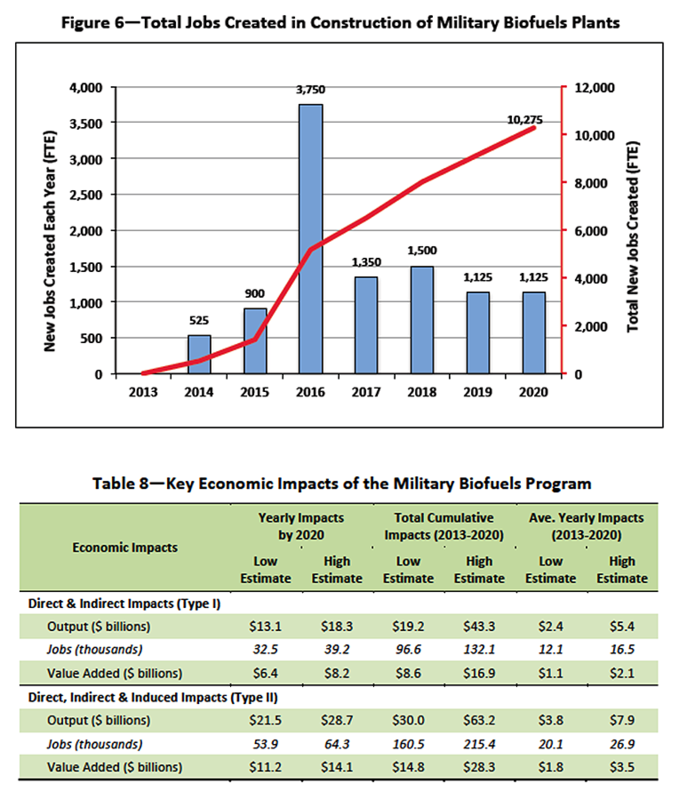 The military biofuels program. Advanced biofuels are renewable, liquid transportation fuels that can replace traditional gasoline and diesel, while creating significantly lower greenhouse gas (GHG) emissions. E2 has been tracking the development of the American advanced biofuels industry (see its biofuels website www.fuelinggrowth.org), and supporting federal policies to enhance biofuels expansion—the Renewable Fuel Standard (RFS) and California’s Low Carbon Fuel Standard (LCFS), as well as the biofuels investments and procurement targets of the DoD. The U.S. military’s alternative fuels program is part of its national security strategy, including energy efficiency and clean energy initiatives—to reduce the military’s energy needs and reduce its dependency on foreign sources of fuel. Specifically, the Pentagon has set targets for replacing half the Navy’s and Air Force’s consumption of petroleum-based fuels with alternatives by 2016 and 2020, respectively. The Air Force and the Navy’s goals will jointly require about 770 million gallons of advanced biofuel capacity. This is backed by a joint investment from the Navy, the U.S. Department of Energy (DOE) and U.S. Department of Agriculture (USDA) to provide $510 million over a three-year period for the development of advanced biofuels to meet the military’s requirements. The HRS-E2 study. E2 asked HRS to conduct a first order analysis and bounding exercise to estimate the potential economic impacts—output revenues, employment, and GDP/value added—resulting from of these investments and demand signals. The HRS-E2 study also sought to identify the potential economic impacts from a regional perspective. The alternative fuels must have “drop-in” capability, with energy and performance characteristics comparable to petroleum fuels, and therefore do not require equipment modifications. In fact, both the Navy and Air Force have successfully demonstrated 50/50 blends of “drop-in” biofuels and petroleum-based jet and marine diesel fuels in almost all of their aviation and marine fleets. Although the military is “agnostic” regarding the kinds of feedstock and conversion technologies used to produce these fuels, there must be suitable and diverse supplies of feedstock available to meet its targets, they must be able to be produced commercially on a large scale, and only non-food sources of feedstock should be used. The “drop-in” biofuels the military has tested that meet these criteria include fuels made from food waste and used cooking oils, oil seed plants (such as camelina and jatropha), wood chips and agricultural residues. The military must be able to use existing fuel distribution system (pipelines, railroads, tankers, trucks, and barges) that currently transport petroleum fuels. The new fuels must be price competitive with the petroleum fuels they are replacing. Methodology. The study drew upon a wide range of data and information sources, including empirical data from operating or soon to be operating U.S. plants, and detailed engineering-economic studies of facilities that produce fuels that meet these criteria. 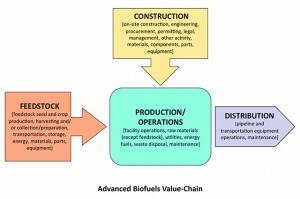 Because the industry is still embryonic and there are only a relatively small number of studies and real-world examples of “drop-in” biofuels production to draw upon, discretion was required in choosing values to approximate a realistic range of costs and benefits associated with the value-chain sectors. HRS applied the selected data to its Military Biofuels Economic Impact Analysis (MBEIA) model based on the cost structure of the main sectors of the advanced biofuels value-chain (i.e., feedstock, construction, production/operations, distribution), which was used to calculate the total estimated direct, expenditures and jobs associated with producing “drop-in” biofuels on the scale required to meet the military’s fuel targets. 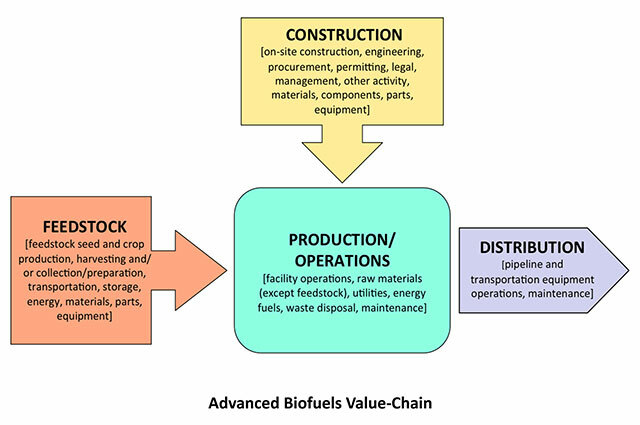 Indirect impacts refer to the change in economic activity resulting from subsequent rounds of production inputs purchased by industries affected by the projected military biofuel purchases. Induced impacts refer to changes in economic activity resulting from changes in spending by workers whose earnings are affected by military biofuel purchases. Study findings. 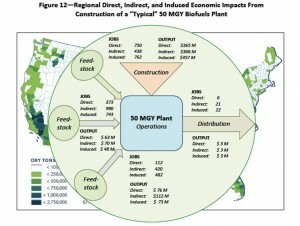 Based on this analysis the study found that the nascent biofuel industry in response to the military alternative fuel targets would potentially create thousands of domestic jobs and billion of dollars in new revenue, especially in states or regions with biorefineries. 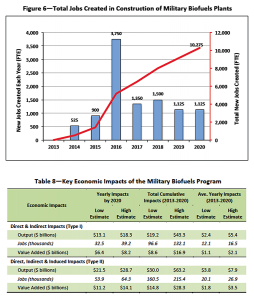 Meeting DoD’s biofuel targets will directly generate between $9.6 and $19.8 billion of economic activity by 2020. Between 14,000-17,000 new jobs will be created by 2020. If measured on a job-year basis, the total number of jobs created would be more than twice that amount. Of these jobs, 3,000-5,000 will be permanent rural agricultural jobs from biomass production, and about 1,200 will be in biorefinery operation. 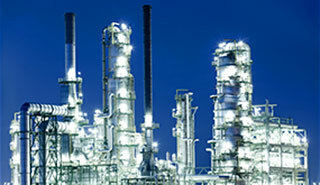 An additional 10,000 jobs will be created from biorefinery construction. The indirect and induced inputs are summarized in the table shown here (Table 8 in the HRS-E2 Study). Regional impacts. Although it was not possible to analyze the geographical distribution of economic growth that might arise from the military biofuels program, the MBEIA model could be used to look at the potential impacts of a “typical” drop-in biofuel plant, if it were built in a local region. 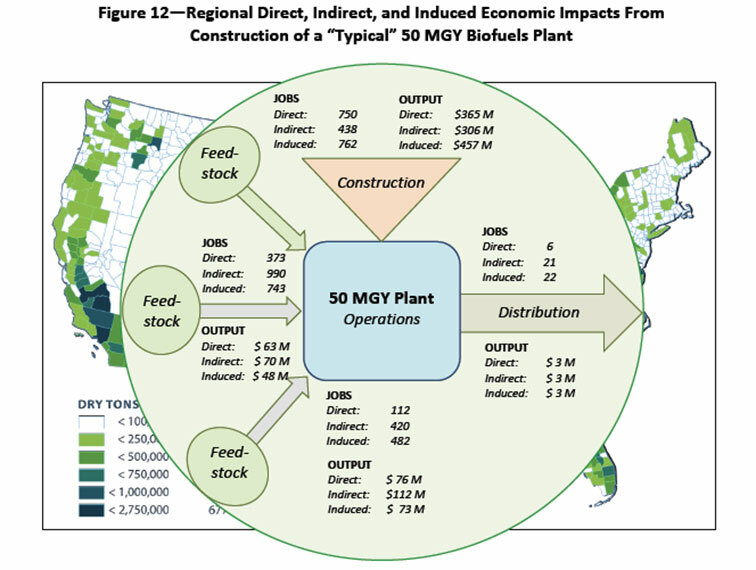 In sum, the study found that between 2013 and 2020, a typical 50 million gallon biofuel plant could add as many as 750 construction jobs, 491 permanent production, operations and distribution jobs, and $1.2 billion in output to a rural economy with biomass resources. In addition, the study calculated that the total value of direct, indirect and induced benefits could reach $3.8 billion of output and 21,000 job-years over the eight-year period, a significant portion of which would remain with in the regional economy. Conclusion. The HRS-E2 report findings suggest that the Pentagon’s biofuels initiative could stimulate the growth of a larger biofuel industry that serves civilian as well as military markets. By attracting private capital into technology development and biorefinery construction, it could accelerate the scale up and deployment of biofuels, making them increasingly cost competitive, providing clean fuel choices for civilian industries, especially commercial aviation. © High Road Strategies, LLC. Site Design By One Lily.